Sometimes an act of kindness, no matter how small on the surface, can mean a lot. Especially to a young boy battling cancer. Chase Lock is almost 8 years old but he's still in the first grade after a rare brain cancer diagnosis kept in the hospital for almost a year. 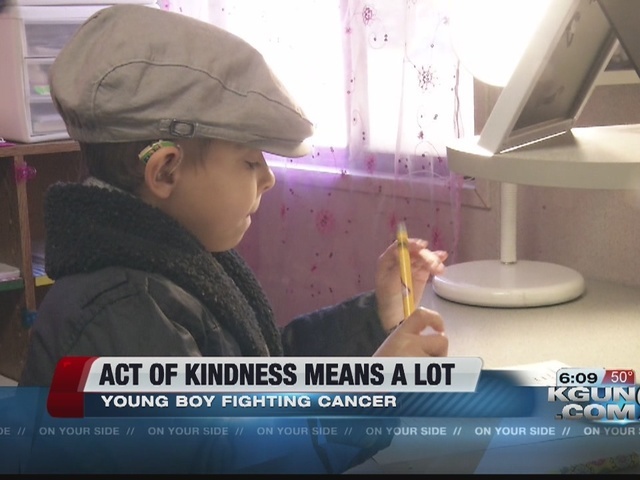 "He received intense chemotherapy followed by three tandem bone marrow transplants," said his mother, Angel Lock. She says he was diagnosed at age two. He was in recovery for two years after his initial treatment when doctors found another tumor right after he finished pre-school. He missed his entire kindergarten year. After all that, Angel says school is very important to him. When they ran an errand at the Apple Store at La Encantada last week, Chase found a quiet spot in the corner to work on homework. "I noticed that one of the other associates had come over and started talking to Chase," said Angel. Soon after, the store's manager approached Angel. "He says, 'well my associate came back to me and she was in tears because she had a chance to talk to your son and your son said he was doing his homework because he really wanted to make sure that he was in the second grade,'" said Angel. The store decided to give Chase a free iPod Nano as a small gesture. But Angel says what they didn't know was how obsessed Chase has become with time and now he can check it whenever he wants. "It's a big safety thing because when he was in the hospital, not knowing what was going to come next was sometimes scary," said Angel. "And he's become very scheduled and very routine and for him, time is safety." Chase also loves music and dancing. His mother says it's how he gets away. "Tell them which songs because I think they'll be surprised," Angel said to Chase. And Chase responded, "'Achy Breaky Heart', 'We Will Rock You,' 'Gangnam Style.'" After they left the Apple Store, Angel says she didn't think that her simple "thank you" was enough. She posted about the experience on her Pray for Chase Facebook page and at last check, the post had more than 10,000 likes and almost 3,300 shares. Angel said she hoped that by posting it on Facebook, it would somehow get back to the employees at Apple. "It really means more than I think they would ever know," she said.